President Michel Suleiman warned the international community that Lebanon will “not accept” any agreement that goes against its interests. Suleiman said that Lebanon reserves the right to liberate the country’s occupied land—including the Kfar Shouba hills, the Shebaa Farms and the northern half of Ghajar village—by all permissible and legitimate means, on Friday in his address to the UN General Assembly. “Lebanon will not accept any solution to the Middle East if it contradicts its supreme national interests,” Suleiman told the U.N. Security Council in New York. “Lebanon is still looking forward to a just and comprehensive peace in the Middle East on all tracks on the basis of the Madrid Conference and. resolutions of international legitimacy and the Arab Peace Initiative,” he said in a speech prior to his speech before the General Assembly later Friday. “While Lebanon abides by UN Security Council Resolution 1701, Israel continues to violate Lebanon’s sovereignty,” he said, calling on the international community to take a stance against the Jewish State. Suleiman addressed the Israeli-Palestinian peace talks, reiterating Lebanon’s opposition to the naturalization of Palestinian refugees within its territory. He also said that Israel’s continued settlement building obstructs the possibility of achieving peace. “Lebanon reiterates its condemnation of international terrorism, from which it had suffered, and there must be a differentiation between it (terrorism) and the legitimate resistance to occupation,” he added. Israel and the Palestinians began the long-awaited direct peace talks on September 2, but the negotiations have been threatened by the possibility that Tel Aviv will not renew its settlement freeze at September 26. The Palestinians have vowed to leave the talks if settlement building begins again. The president also called for more support to de-mine Lebanon and reiterated Beirut’s demand for Israel to compensate Lebanon for the losses Tel Aviv inflicted through the mines and cluster bombs it dropped. “Lebanon affirms its right to its water and petroleum resources, which it is working to extract on the borders and especially those delineated southward according to the map that the UN laid out,” he added. The parliament on August 17 approved an oil draft bill that authorizes the exploration and drilling of oil and gas fields off the shore of Lebanon. Suleiman also commended the work of UNIFIL and voiced the importance of continued cooperation between the Lebanese army and the peacekeepers. 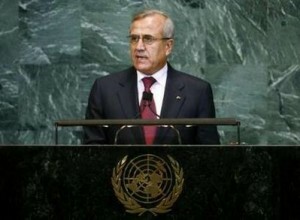 Suleiman traveled to New York on Thursday for the 65th session of the UN General Assembly, which began on September 14. Alah Youhfadak Ya Fakhmit alraeess. Why did you even bother come to the UN? You should have saved the money. You should have stayed back in Beirut where you are needed badly. Some times I don’t blame you for traveling a lot. Dealing with Lebanese politicians is a pain. The UN meetings are nothing but social gatherings. The general assembly is always empty when heads of states are delivering speeches. Only when Obama speaks, people sit and listen. Alah Youhfadak Ya Fakhmit alraeess. Why did you even bother coming to the UN?